Beach wedding anyone? If the romance of barefoot and on the beach is how you have always dreamed of getting married, then you will have a lot of fun planning and designing your seaside nuptials. 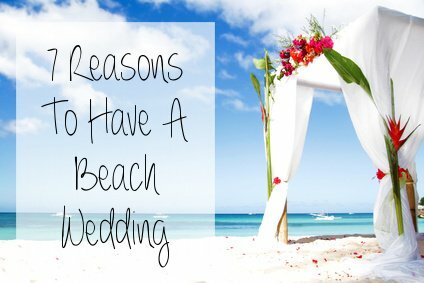 I am sure that you don't need any convincing, but just in case you have your doubts, lets look at some of the pro's and cons of beach weddings. 1. The seaside is certainly one of the most beautiful and romantic venues for a ceremony and/or reception. You have one of the most spectacular settings that nature can offer. 2. If chosen right, they can be very secluded and intimate, and therefore all the more special. 3. It is the definitive "relaxed" and informal wedding. If you cannot stand the idea of a stiff and formal event, then this is definitely for you. This is exactly why it has become trendy to wed on the beach. 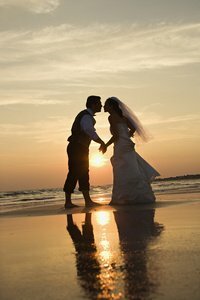 More couples opt for the relaxed feel of a wedding on the beach as opposed to the often very formal traditional church ceremony. 4. When you are not so restricted by tradition you are free to personalize your special day with elements true to yourselves. 5. Your seaside wedding or beach themed celebration can range from absolutely informal to semi-formal all the while retaining the carefree and fun ambiance that made you fall in love with the idea in the first place. Want a totally chilled BBQ? No problem. How about a classy cocktail party? Totally appropriate! All up to you. 6. More economical. They can often work out to be more economical since they are often also destination weddings. This means that fewer guests will be able to come and therefore it will cost you less in the end. 7. By having your wedding on a gorgeous stretch of shoreline in an exotic location it makes this important step in your life so much more memorable, not only for you, but also for your guests. I am sure you have had a walk on the beach when the sun was just starting the set. You soaked up the magic and romance of this twilight moment with the sound of sea and the gulls in the background and a light breeze lifting your hair. If this is what you would call a perfect moment, then there is no better place for you to exchange your vows with the one you love than on a beautiful beach. 1. 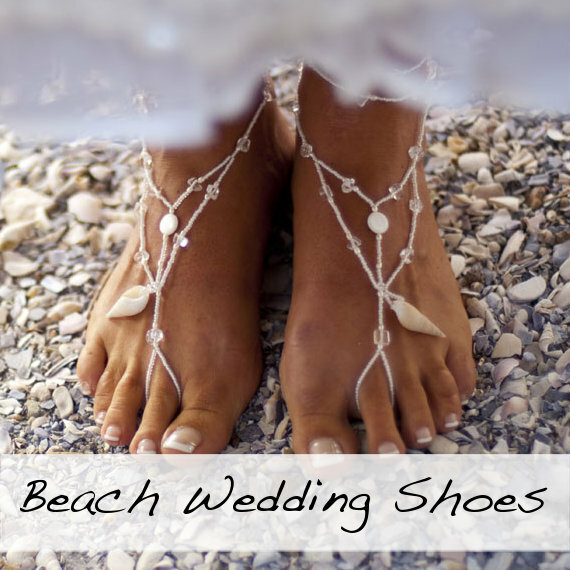 If you want to be an all out barefoot bride (or groom), then have both your ceremony and your reception on the beach. 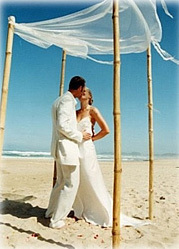 Say your vows under a beautiful bridal gazebo and dance the night away barefoot on the sand. 2. Don't want to worry about the logistics of a reception on the beach? Have a romantic sunset wedding ceremony on the beach and host your reception at a suitable venue close-by (preferably with a killer view of the ocean!). 3. If you have always dreamed of walking down the isle of your church, but you also like the idea of a wedding on the beach, then say your nuptials in a church or a chapel. and have a beach side wedding reception. 4. 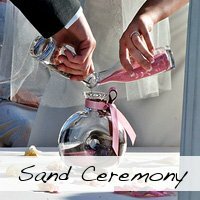 You can also opt to have your ceremony and your reception somewhere else and just have your cocktail hour on the beach. 5. 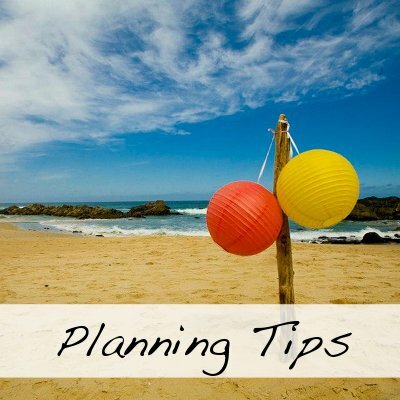 Or finish your wedding reception at a reasonable time, go and put on another dress and have a beach wedding after party! 6. If you are nowhere near the ocean, but want to use it as the inspiration on your special day, simply have a beach themed wedding wherever you are! This can include an open air ceremony near a river or lake, in a church or even at your reception site. So, Where To Start On Planning Your Beach Wedding? Take some time to browse through this site maybe starting with the links above, or perhaps you are just looking for some fun ideas to add to your day, find some inspiration on exciting themes or some help with finding everything from the invitations to the perfect grooms attire. 2. Like us on Facebook. 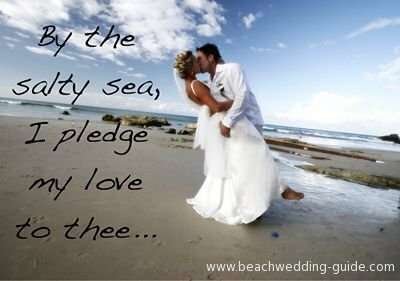 Here we post any interesting things we find on the web related to beach weddings and destination nuptials. 3. 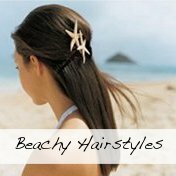 You can also very simply bookmark our Beach Wedding Blog and visit back often to stay up to date with any new pages we add or updates we make to the site. 4. You can of course also follow us on Pinterest. 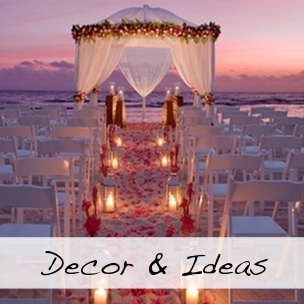 We pin some really great ideas and tips for all things to do with beach weddings from dresses to decor. 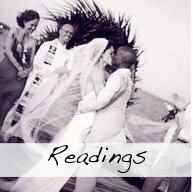 Enhance your ceremony with sweet and romantic beachy readings and poems.